If you’ve been blogging for a few years, you probably have some gems buried in the archives that your current readers have never seen. Too often, bloggers simply copy, paste, and re-post old posts, creating the potential for duplicate content penalties. But there are better ways to revive your archives. 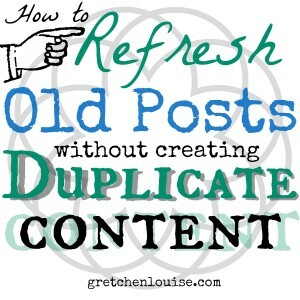 Here are tips and best practices for refreshing and re-sharing old posts without re-posting and creating duplicate content. Why would you want to revive something from the archives? 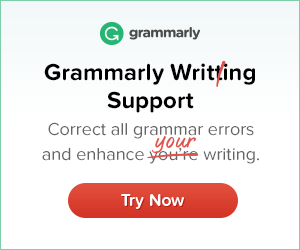 Improve your original post with text edits, monetization, or graphics. Bring more awareness to a post that was perhaps created when you had less followers or simply didn’t get the attention it deserved. Call attention back to an evergreen post on a popular topic. How do I decide which posts to refresh first? Edit your original post to your heart’s content. Add a new “Pinterest-worthy” graphic (don’t forget to watermark it with your domain name). Make sure your post is monetized in any way possible (and properly disclosed). Add an “updated” date if you like (or show “last updated” rather than “posted on” date in WordPress). Bonus: If you use a permalink structure that doesn’t show the date, the post will appear timeless no matter when you share it. Share the new graphic on Pinterest and Facebook. Share a quote from the post with a link in your newsletter. Email the entire post out to your blog’s email susbcribers (in MailChimp or Mad Mimi, create a regular campaign rather than RSS to email campaign, paste the post into the content area, and send it to your “blog posts” group or list). Share a link to the edited post in a “Weekend Links” or monthly round-up post. Create a “Best Of” page for the year and link back to your edited posts. Create topical “content landing pages” or “cornerstone pages” and include your edited posts there. Ask your mastermind group if they wouldn’t mind sharing your edited post on their social media outlets. Find a current link-up that fits your post and share it there (check the rules to make sure there aren’t stipulations about it being a new post, and be prepared to add a link to the link-up in your post). Change the post date to the current date to try to bring the post back up in RSS feeds (this process varies by platform and feed burner). You can even create a special shortcode to automatically display a list of recently updated posts in a specific page or widget. How can I automatically share old blog posts? Use a related posts plugin like nRelate related content orYARPP to show posts that are similar to the post someone is currently reading. That will drive traffic to your archives with no effort on your part. Use a plugin like Tweetily or Evergreen Post Tweeter to automatically Tweet old posts based upon date, category, etc. Be sure to indicate via a preface or hashtag that it’s a post from the archives. And don’t overwhelm your Twitter followers with too many old post links in relation to the amount of new content and personal Tweets you share. How often can I reshare old posts without spamming my readers? It depends on your readers, and the platform you’re sharing on. Tweets have a very short lifespan, so as long as you’re an active Tweeter, using a plugin like Tweetily to share one or two old posts a day isn’t going to seem overwhelming. If you’re really organized, you can create a list of your most popular posts and decide on a schedule for sharing them. 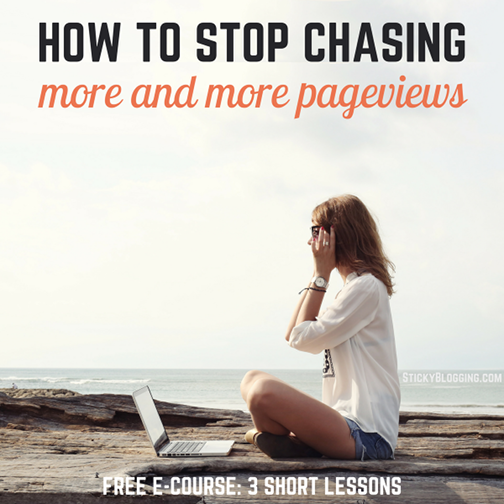 What if I really do want to create a brand new post on my blog? Depending on your blog platform, there are several different ways to go about creating a brand new post on your blog while removing and redirecting the old post. First we’ll take a look at the ones with cumbersome steps and less than ideal results. Cut the content from the original post, paste it into a new post. Publish the new post and edit the original post to have only the link to the new post. Drawbacks: comments are spread out, the original post is empty and people may not click on the new post link. Delete the original post and create a new post. Drawbacks: the original post link is broken and the comments are lost. Blogger: Delete the original post and create a new post, creating a custom redirect from the original post URL to the new one. Drawbacks: the original comments are lost. WordPress.org: Create a new post. Use “Tako Move Comments” plugin to move the original comments to the new post. At this point you can A) Rename the original post slug to some form of gibberish “zzztrashedpost” and delete the original post, renaming the new post with the original post slug (to save social share counts and links to the original post) or B) Create a redirect from the original post URL to the new one (you’ll lose any original post share/like counts). Drawbacks: time-consuming and cumbersome. How do you refresh old content? What’s the most effective method you’ve found for sharing posts from your archives? 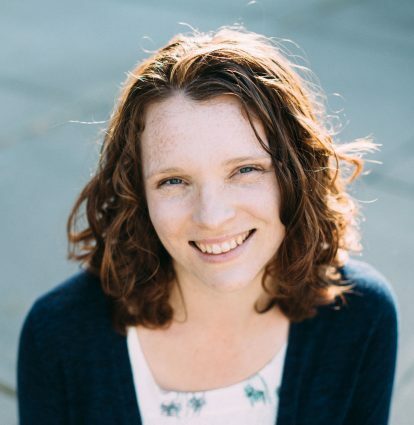 Design by Insight: how can I repurpose my blog’s content? I’m busy going through the archives and updating old posts. I really do think whilst it can be hugely time consuming, it’s so worthwhile doing. Thanks for these tips. Wishing you a happy and enlightening New Year! The problem with those evergreen, dateless posts is, people looking for latest information on a particular topic wouldn’t look at them, even though you may have published your article a few minutes back.. It’s just that dates are not always useless. In fact they’re hardly harmful. Hi Gretchen, Thank you for your post. It has raised new questions for me to ask you. First off, I went to the link you posted about changing the “publish date” to be “updated date.” But it looked super confusing to me, someone who is not an html chick. So I need to change it for EVERy post I refresh or is it a setting I can change in WordPress that fixes it for every post? Your best alternative may be just to update the date on the post whenever you make significant changes. Does that make sense? Hi I was expecting something a bit different but I think is possible for you to know the answer. I have seen many blogs that re-utlize old post. Here is what I want to do: I want to lets say re-utilize a blog post I wrote a month ago without republishing it but I want it to appear again on my homepage (Which is made from the latest posts), how do you do that? To do that you’d either make it a “sticky post” in WordPress, or just change the publish date to today’s date. Hope that helps! Great tips Gretchen! Thanks for sharing them. I have been s.l.o.w.l.y. working on this. (I think I’m up to 3 or 4 posts now) but I never thought about looking at my analytics to determine which ones to do first! I don’t often comment, but now that I am today, I want to make sure and let you know how MUCH I appreciate your website and all your tips! I’ve learned so much from you in the short time (maybe 2 months?) I’ve been following you. Okay – a question for you. I just recently moved from WordPress.com to WordPress.org and I imported all my old posts from my old site to my new one. Do I get penalized for duplicate content when I do this? Thanks so much for your comment. Yes, if you leave your beckydoughty.wordpress.com site as is, you could be penalized for duplicate content. You have two solutions. 1) Pay for WordPress.com’s redirect package (http://en.support.wordpress.com/site-redirect/), which maintains all your old wordpress.com permalinks. 2) Make all your old posts private and create a new post saying “I’ve moved” and point them to your new beckydoughty.com domain. The downside of that is that it breaks any old links to your posts. Great! Yes. I’ve scheduled my final goodbye post at the old site for this Friday, so between then and now, I’ll go unpublish all my old stuff and leave the forwarding info. I hope in the last month since moving stuff, I haven’t already shot myself in the foot, but oh well. It will all come clean in the wash at some point!